This clinic is designed to help develop and improve overall shooting skills. Instructors will coach student to improve performance, consistently, and hit the target exactly where aiming. THIS CLINIC IS FOR SHOOTERS THAT HAVE TAKEN A CCW OR FIRST SHOTS CLASS BUT STILL WANT MORE INSTRUCTION. 9mm, and 45 caliber semi-autos, as well as 38 special revolvers and ammunition. 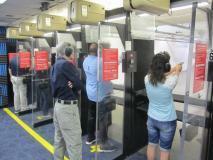 help you become more proficient and confident with your own firearm.